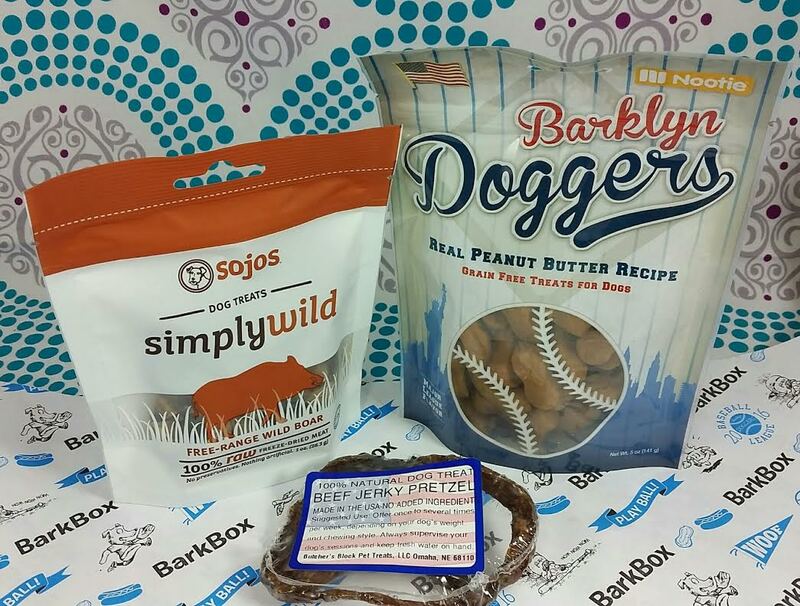 Sojos Simply Wild Free-Range Wild Boar Treats- Sojos is a well-respected brand and I'm definitely pleased to see it in Barkbox. If you feed your dogs a RAW diet, you are probably familiar with them. These are made of raw, natural USDA certified wild boar. These are high in protein, low in fat and freeze-dried to lock in the natural enzymes, vitamins and minerals. I will happily give these treats to the boys with no worries. When they were puppies and in training classes, freeze dried liver was my "high value" treat. They will both do anything for freeze dried treats now. Nootie Barklyn Doggers Peanut Butter Treats- If you're really conscious of where your dog treats come from, it may not make you happy to know that this does not specifically say on the bag that these are made in the US. There is a flag but no verbiage unless you're looking on the Barkbox website. Otherwise, these are grain free treats made with peanut butter and chicken. I always have to pay attention to the ingredients because Dexter can't digest chicken. It's hard because it seems to be in nearly EVERYTHING no matter what "flavor" it is called. Which is another reason I love that the Sojos is made from a single source protein. Butcher's Block Beef Jerky Pretzel- Made from pure USA beef muscle, these make great treats for mild to moderate chewers. I have rat terriers and they are chewing machines so this didn't last long. I'm pretty sure Dexter was very happy to eat it, though. Delca Corp. Think Dog Fire Baller- This was an immediate hit with Bugsy. He's a big fan of balls but this one had the added griptasticness of a flame. I actually appreciate that, too, because it means there's a possibility of not getting completely gross with dog slobber every time I pick it up to throw it for him. The other great thing about this toy is that once the nylon cover gets chewed off, there's still a spiky rubber ball under there. So far neither dog has been able to destroy a ThinkDog spiky ball. That's a miracle! 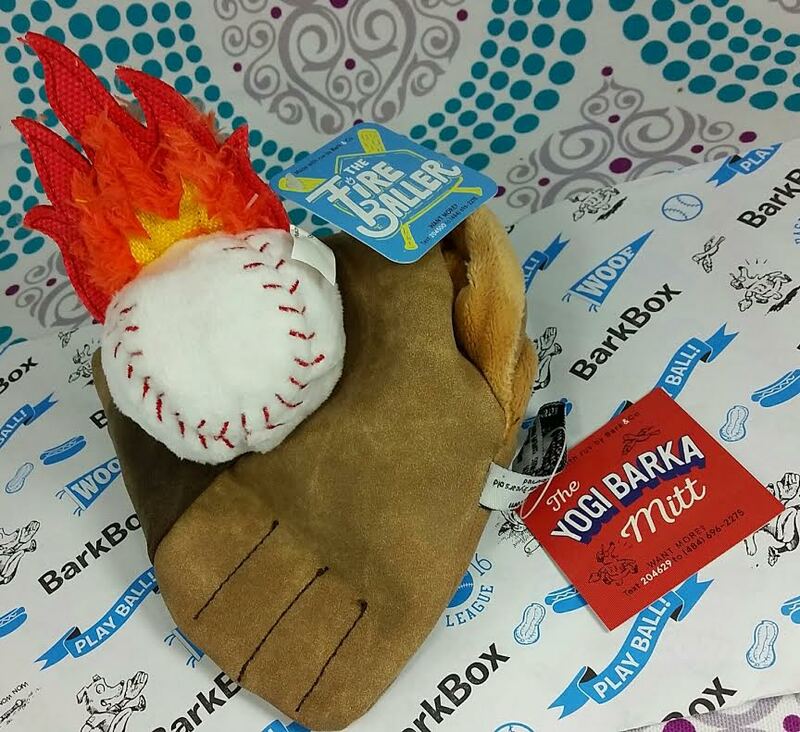 Barkbox Yogi Barka Mitt- This is a flat piece of faux suede with a squeaker. It was immediately de-squeaked but I found Dexter chewing on the mitt itself yesterday. He's really picky with toys so I'm always glad when one shows up that he'll play with. 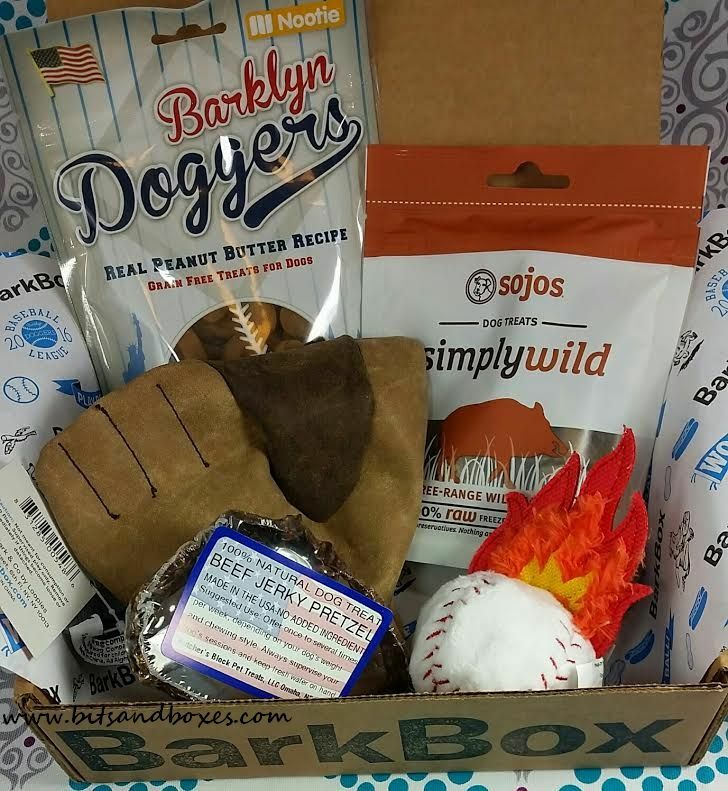 If you would like to spoil your dog with a Barkbox, you can do that here. You can use my referral link and get a FREE box added to your subscription. If you use Ebates, make sure to activate it and get your $3 cashback, too. If you don't use Ebates and you shop online a lot, I highly recommend them as a cashback site. Seriously. I'm sad I didn't know about them years ago.